Back in college, I used to go home over the holiday breaks and come back to campus with homemade goodies for my friends. One time I returned from winter break with tiramisu. I was never allowed free reign of the household alcohol in our liquor cabinet as I was under 21 at the time, but when it came to cooking or baking, my mom could care less. As long as I didn't straight up drink it by the glass, it was all good. Rum, Kahlua, Chambord, Bailey's ... I could use as much as I wanted. It was my loophole. I loaded it up to the max with Kahlua. Back at school, my friends took one bite of the stuff and refused to eat the rest because it tasted way too alcoholic for tiramisu. Eight years later, they still make fun of me for my "Alcoholic Tiramisu." 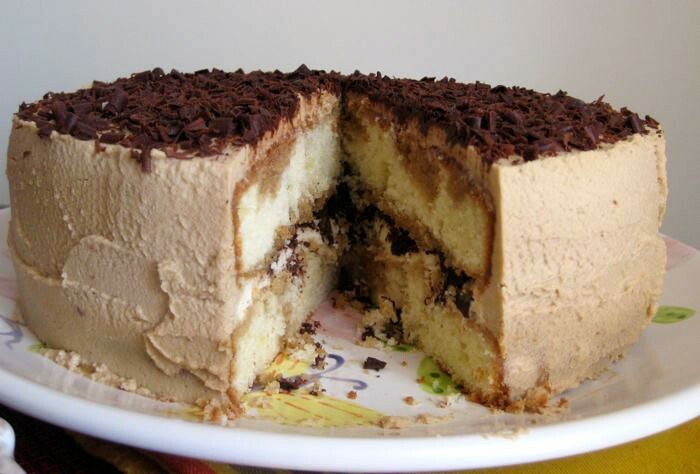 Don't worry... this Tiramisu Cake is nothing like that. 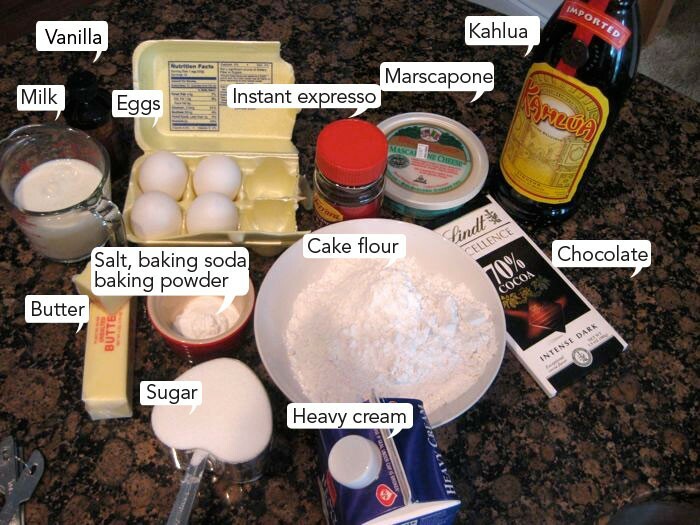 I followed the recipe exactly and used only two tablespoons of Kahlua for the entire cake. 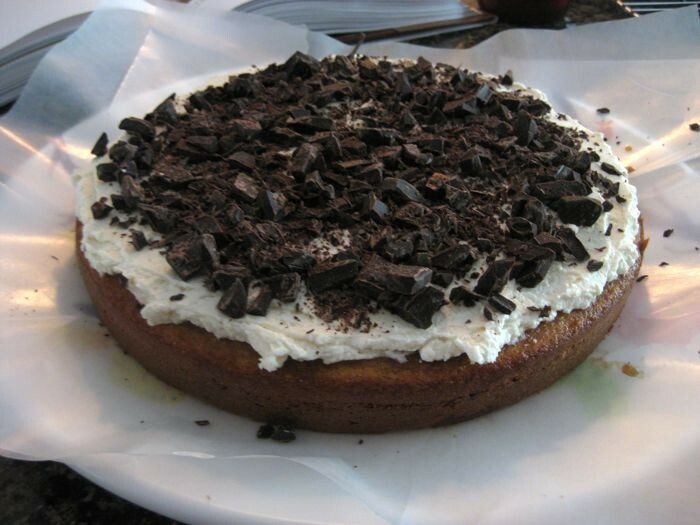 Two white cakes are brushed with an espresso syrup, then layered together with a fluffy coffee-flavored marscapone and whipped cream filling, studded with bittersweet chocolate, frosted with more marscapone and whipped cream, and topped with shaved chocolate. The recipe comes from Dorie Greenspan again ... I used the recipe found in her book Baking: From My Home to Yours. I won't say it was easy to make. The cake took a few hours to put together, but I'm sure it was worth it. The verdict is still out as to how it tastes though since I'll be serving this up at a dinner party tonight. (Oh, that piece of cake that was photographed? That's sitting in my fridge wrapped up  I haven't touched it.) I did taste a bit of the cake from scraps I cut off from the domed cake tops though. 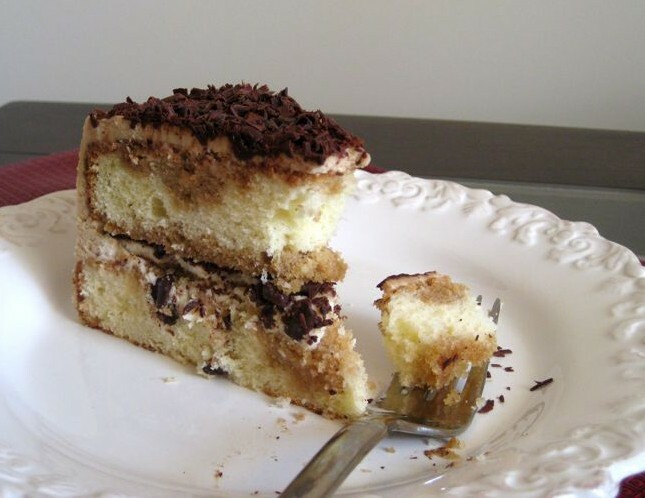 The cake seemed to be the perfect canvas for the coffee and cream filling  plain vanilla, good crumb, sweet, but not to sweet. I tasted the leftover filling too. I could probably fill up a parfait cup with that coffee-flavored marscapone cream, grab a spoon, and call it a day. Yeah, it was that good. Yum. Getting ready: Center a rack in the oven and preheat the oven to 350 degrees F. Butter two 9 x 2 inch round cake pans, dust the insides with flour, tap out the excess and line the bottoms of the pans with parchment or wax paper. Put the pans on a baking sheet. Working with a stand mixer, preferably fitted with a paddle attachment, or with a hand mixer in a large bowl, beat the butter on medium speed until soft and creamy. Add the sugar and beat for another 3 minutes. Add the eggs one by one, and then the yolk, beating for 1 minute after each addition. Beat in the vanilla; dont be concerned if the mixture looks curdled. Reduce the mixer speed to low and add the dry ingredients alternately with the buttermilk, adding the dry ingredients in three additions and the buttermilk in two (begin and end with the dry ingredients); scrape down the sides of the bowl as needed and mix only until the ingredients disappear into the batter. Divide the batter evenly between the two pans and smooth the tops with a rubber spatula.Bake for 28-30 minutes, rotating the pans at the midway point. When fully baked, the cakes will be golden and springy to the touch and a thin knife inserted into the centers will come out clean. Transfer the cakes to a rack and cool then for about 5 minutes, then run a knife around the sides of the cakes, unmold them and peel off the paper liners. Invert and cool to room temperature right side up. To make the syrup: Stir the water and sugar together in a small saucepan and bring just to a boil. Pour the syrup into a small heatproof bowl and stir 1 tablespoon of the espresso extract and the liqueur or brandy; set aside. To make the filling and frosting: Put the mascarpone, sugar, vanilla and liqueur in a large bowl and whisk just until blended and smooth. Working with the stand mixer with the whisk attachment or with a hand mixer, whip the heavy cream until it holds firm peaks. Switch to a rubber spatula and stir about one quarter of the whipped cream into the mascarpone. Fold in the rest of the whipped cream with a light touch. To assemble the cake: If the tops of the cake layers have crowned, use a long serrated knife and a gentle sawing motion to even them. 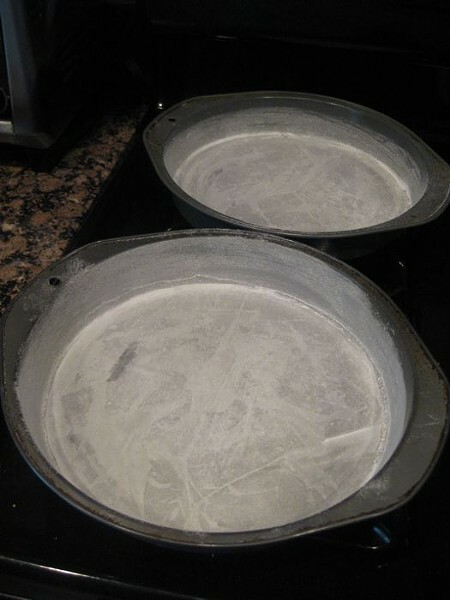 Place one layer right-side up on a cardboard round or a cake plate protected with strips of wax or parchment paper. 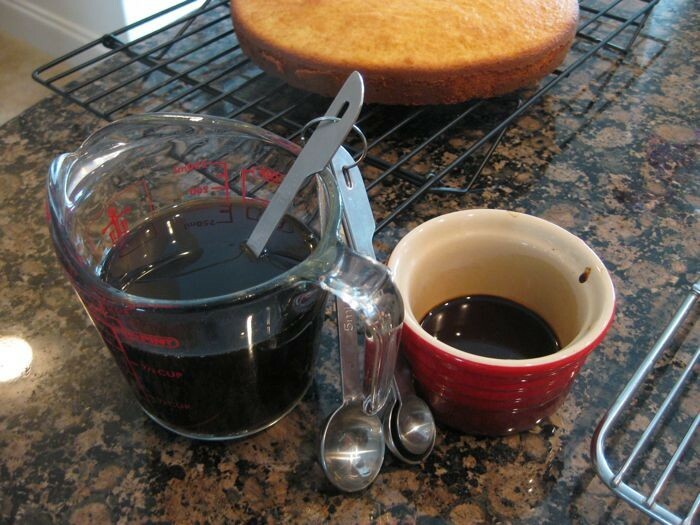 Using a pastry brush or a small spoon, soak the layer with about one third of the espresso syrup. 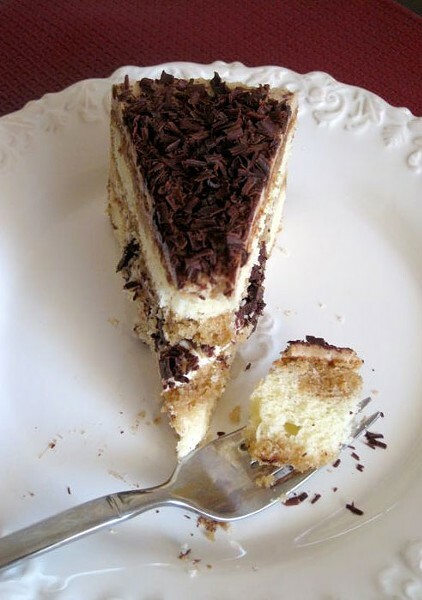 Smooth some of the mascarpone cream over the layer  user about 1 1/4 cups  and gently press the chopped chocolate into the filling. Put the second cake layer on the counter and soak the top of it with half the remaining espresso syrup, then turn the layer over and position it, soaked side down, over the filling. 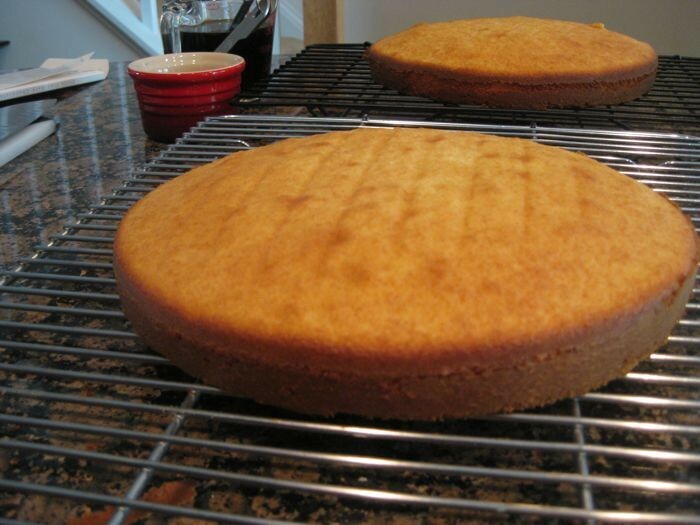 Soak the top of the cake with the remaining syrup. With a long metal icing spatula, smooth the frosting around the sides of the cake and over the top. Refrigerate the cake for at least 3 hours (or for up to 1 day) before serving  the elements need time to meld. Just before serving, dust the top of the cake with cocoa, or top with shaved chocolate.